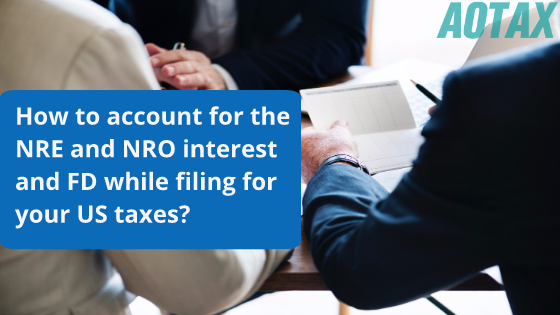 How to account for the NRE and NRO interest and FD while filing for your US taxes? According to the data available with the Indian Ministry, India ranks second among all countries for citizens who have temporarily or permanently shifted to other countries. The number stands at a staggering 25 million across some of the most prominent countries around the globe. And this is where the concept of NRI comes into the picture. An NRI or Non-Resident Indian is any individual who has an Indian passport and has emigrated to a different country. This is mostly on a temporary basis either for education, residence, work or other purposes. Thus, it is extremely important to understand the different taxes that an NRI is liable to pay, so as to remain clear of both the countries. To make matters a bit easier, the Indian government allows for two types of accounts for NRI’s, namely NRO and NRE. And depending on your residential status, you with either be taxed on your global income or income in just one country. In case, you are an NRI and receive all your income in the USA, you will be taxed on in the USA. However, if you are a resident of India, then you will be taxed on your global income. To make matters a bit easier, the Indian government allows for two types of accounts for NRI’s, namely NRO and NRE. NRE account can be opened by depositing foreign currency. While an NRO account can be created before leaving the country with the intention of being an NRI. In either case, an individual will earn some interest on the amount deposited in the account. Thus, the most common question among NRI’s is how to account for the interest earned on NRE and NRO accounts or even Fixed Deposits that they have in their accounts. This is where the water gets a bit muddy. There are different schools of thoughts, where some do feel there is a need to declare the interests earned on the above fronts, while others feel it is necessary to do the same. The latter is a more preferable situation to be in. Any interest that you earn from your NRE or NRO account or even Fixed Deposits for that matter is taxable. And you must not forget to include the same while your US taxes. The same is applicable for any dividends that you earn. Fixed Deposit acts like a capital asset, where you invest a certain amount of money and receive yearly interest on the same. Thus, its maturity is similar to selling any other capital asset, as you make money out of it. The interest adds to the base amount and thus the taxation comes into the picture. For the interest that you have earned either on FDs or NRO or NRE accounts, you must first convert the same into USD for the financial in contention. Once you are done with the conversion, make sure to add it in the Form 1099-INT and then file your taxes. However, one must be careful with the tax rates. For instance, the interest that you have earned is INR 25,000 and you end up paying the 20% taxes to the Indian government. If you tax slab is 40% in the United States, you must pay the additional 20% taxes to the IRS. And this is in accordance to the DTAA or Direct Tax Avoidance Agreement between the two countries. If you are an NRI, you most probably have an NRO or NRE account with any of the leading banks in India. It is important to disclose the interests earned from these accounts in your tax returns to avoid any form of discrepancies and to ensure a smoother tax filing season. 3 Tax Investments that I can make AFTER 12/31? How to account for your Indian investments while filing for US taxes? Can an NRI continue his PPF?